Refer to the exhibit. Given this partial configuration, which statement is true? A. The 209.165.200.230 router is a P router. B. The 209.165.200.230 router is a CE router. C. The 209.165.200.230 router is a PE router. D. The 209.165.200.230 router is a customer router behind the CE router. You have been asked to verify if the OSPF protocol is enabled for Layer 3 MPLS VPN service on the link between the PE and CE. Assume the PE is running on Cisco IOS XR software. 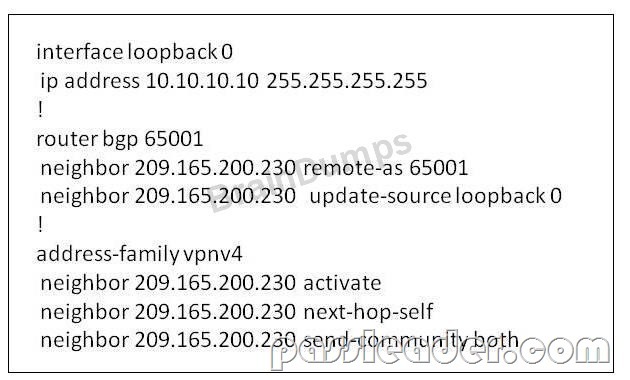 Which command should be used to verify that the OSPF protocol is enabled for Layer 3 MPLS VPN service on a link between a PE router and a CE router? You want to collect net flow-related information from your core links. You also want label switch traffic to be included in the information collected by NetFlow. You have MPLS, MPLS VPN, and protected TE tunnel in your core. How many labels should NetFlow analyze to collect information for all types of MPLS applications used in your core network? Refer to the exhibit. Given the partial configuration, which statement is true? A service provider is running OSPF and has turned the network for fast convergence. The service provider has determined that its routers should also be configured for LDP synchronization. If the service provider follows ITIL-based practices, how should this change be treated?